∗ When Was The Portrait Painted? Did We Find The Actual Book? ∗ Mysterious Payment For "Picture"
Copyright © 2018 Omnis, Inc.
Who Was O. Roy Chalk? O. Roy Chalk (7 June 1907 – 1 December 1995) was a wealthy entrepreneur and art collector.1 He and his wife Claire purchased the Delapierre portrait from the estate of Mrs. Josef Stransky at an auction at Parke-Bernet Galleries (now Sotheby's) in New York on the afternoon of 16 October 19542—just a few hours after Hurricane Hazel grazed the city. Is It Significant That Chalk Owned Both the Delapierre Portrait and Houdon Bust? The fact that Chalk owned both the 1785 Delapierre portrait and 1789 Houdon bust of Jefferson for many years may be coincidence. To date, the research team has found no evidence that Chalk had evidence—or even suspected—that the Delapierre subject was Jefferson. Nonetheless, Chalk's prominence and proximity to the Metropolitan Museum of Art afforded him the means to do extensive research, possibly allowing him to uncover some of the details discovered by our team. The New York Times, Saturday, 2 December 1995, Section 1, p. 28. Parke-Bernet auction catalog (French XVIII Century Furniture and Objects of Art, Friday & Saturday, October 15 & 16 at 1:45 p.m., 980 Madison Avenue, New York, 1954), page 56, item number 258 (illustrated), signed and dated 1785. Curiously, the painting was misattributed in the catalog to the artist "Jean-Baptiste Marie Pierre" (French: 1713-1789). This may have been due to misinterpretation of the signature by experts at Parke-Bernet Galleries—or perhaps was because the signature was not clearly legible when they received the portrait. In any event, the first correct attribution known to the research team—in sources dating back to and including the Ugo Bardini letters of 1927 and 1928—occurred in April 1996, when C.G. Sloan & Company in Bethesda, Maryland, offered the portrait for sale (on behalf of Mrs. O. Roy Chalk) in an auction catalog. C.G. Sloan & Company, Inc., auction catalog (Estate Auction, April 13 & 14, 1996, Daily 10 a.m.), page 111, item number 1479 (illustrated), signed "B.N. de la Pierre" and dated 1785. See also The Magazine Antiques, Vol. CXLIX, No. 4 (April 1996), p. 541. Susan R. Stein, The Worlds of Thomas Jefferson at Monticello, Harry N. Abrams, Inc., New York, 1993, pp. 230-231. In a letter to Thomas Jefferson dated 16 April 1802, his daughter Martha Jefferson Randolph said of the bust: "...I found fault with Houdon for making you too old..." (see Thomas Jefferson Encyclopedia, Houdon Bust). Christie's Review of the Season 1987, edited by Mark Wrey and Susanna Spicer, Phaidon-Christie's Ltd., Oxford, 1987, p. 339. Arthur Myers, "O. Roy Chalk: Making His Mark," Coronet magazine, August 1966, pp. 146-151. The New York Times, Saturday, 2 December 1995, Section 1, p. 28. See also, Milwaukee Auction Galleries, Limited, v. O. Roy CHALK, United States Court of Appeals, Seventh Circuit, No. 92-3579. Smithsonian National Museum of Natural History, Gem Gallery - Chalk Emerald. The Washington Post, Saturday, 2 December 1995, p. B5. The Boston Globe, Sunday, 26 May 1991, p. 12. Several websites indicate that Chalk helped Russia draft its first constitution after the breakup of the USSR; however, the research team has not been able to confirm this information. 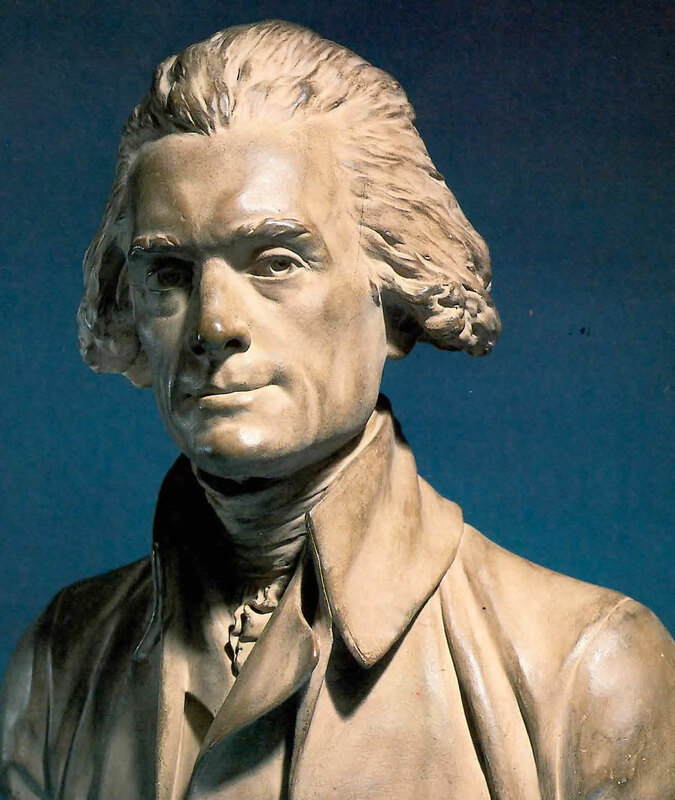 Chalk's purchase of the renowned 1789 Houdon bust of Jefferson suggests that his primary interest was the subject rather than the artist, because other fine busts by Houdon would have been much easier to procure at the time. According to Professor Alfred L. Bush (Jefferson and the Arts: An Extended View...The Life Portraits of Thomas Jefferson, National Gallery of Art, Washington, D.C., 1976, p. 32): "...in 1963, the French Fine Arts Administration provided an export permit for a plaster acquired by Roy Chalk of Washington, [D.C.] but only after another [Jefferson bust by Houdon] was donated to the French government by Edmond Courty." When Chalk's wife Claire inherited the portrait following his death, she may not have been aware of what he knew about the item. 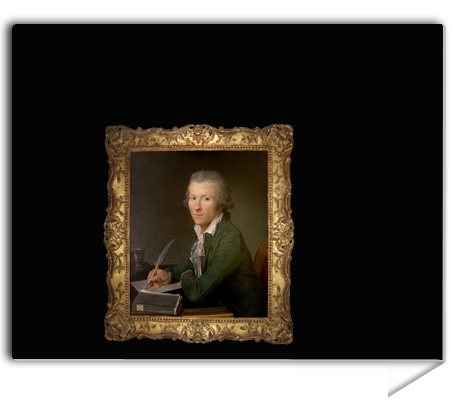 Efforts by the research team to discover more about O. Roy Chalk's knowledge or opinions concerning the 1785 Delapierre portrait have not been successful.